The spread of fake online reviews of products or businesses is becoming a real problem, as outlined in a recent NYT article. There are sites popping up that offer a pay-for-review service, where for a fee, they will add a positive review to Amazon, Google, Yelp, etc. 1. Look at the history of the user posting a positive review – Did the user post other positive reviews of businesses unrelated to the one you’re looking at? If there was only one glowing review for a single product or business, it is most likely a fake review. Dig even further and look to make sure the account history makes sense. Reviews for business in many different geographical location should also set off your fake-review alarm. 2. The review states who they were with – Research has shown reviews that start out by telling the reader who they experienced the product/business with are more often fake. 3. The review explicitly states the name and location of the product or business – Reviews that contain sentences like “this was our first time visiting Taco Time in Mobile, Alabama” have a higher likelihood to be fake. 4. 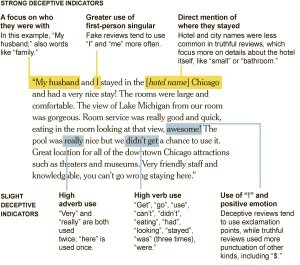 The review uses “I” and “me” – Fake reviews tend to overuse the first-person singular. 5. Too many adverbs – The overuse of the words “very”, “really” may indicate a fake review. 6. 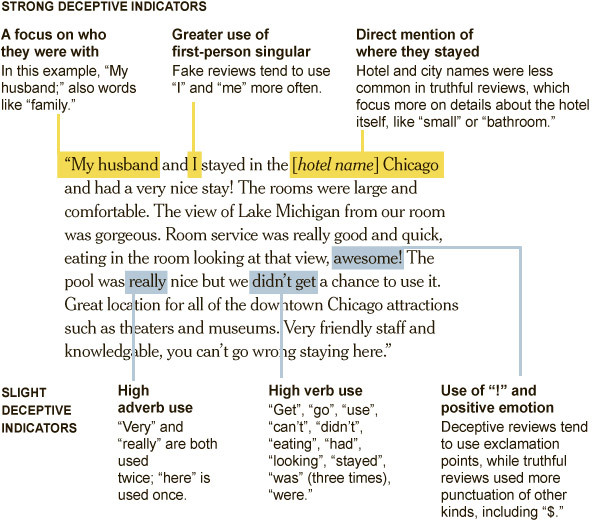 Too many verbs in the review – This one may be tough to spot, but overuse of verbs (“go”, “eat”, “wait”, “get”) in general happens more often in fake reviews. 7. Use of “!” or “!!! !” – Doing this, and adding positive emotion into the review may give away a fake review. Research shows that real reviews contain less positive emotion than fake ones. The source of this information is a paper published by Cornell University department of Computer Science. This entry was posted in Deception, Internet and tagged fake reviews on August 22, 2011 by David.